PATNA: A poor Muslim widow in Bihar has set an example for the society by constructing a toilet at home by money collected through begging. Authorities have honoured the woman for her dedication for the cleanliness campaign. 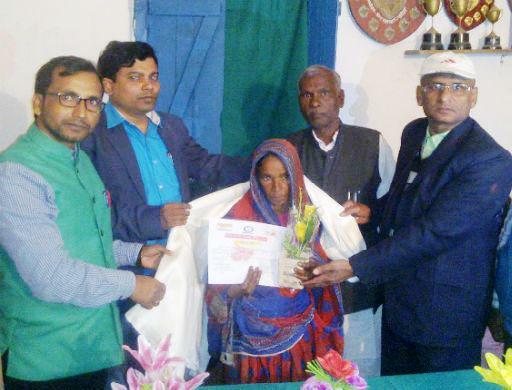 Amina Khatoon, a resident of Pipra block in Supaul district, begged from the local villagers for days so that she could have a toilet a home. The woman stays with two little children in a hut built over the government land. The widow who works as a labourer to run her family got the inspiration for toilet construction after a group of officials reached her village last year and appealed to the villagers to have toilets at homes. She was hugely impressed by the campaign but the money came on her way. According to the lady, she made rounds of the government offices and requested officials for allotting the money to carry the toilet construction works at home but all she was in return was utter disappointment. Eventually she turned to begging to collect the funds for toilet and finally managed o have it. Funds collected, she purchased sand, bricks and other construction materials at home and then hired a mason and labourers for constructing the toilet but moved by her commitment, they refused to take their wages. On Saturday, the local officials in the district rushed to meet her when they came to know about her commitment for cleanliness drive and felicitated her for her wonderful job. The woman was honoured with a citation letter, bouquet and a shawl.